Boulevard Brewing's Rye on Rye paired with an Archetype Axis Mundi Toro. After a two-year hiatus, Boulevard Brewing has brought back its limited-edition Rye on Rye, an ale partially brewed with rye then aged in barrels that once housed Templeton Rye whiskey. The result is a spicy, complex beer that’s brawny enough to stand toe-to-toe with the strongest of cigars. Boulevard Brewing first debuted Rye on Rye in 2010, and after its success, the brewery explored other rye beer variations. These included brews such as Rye on Rye on Rye, a double barrel-aged version, and Rye on Rye–Classic Sazerac Cocktail, which was spiced to mimic the flavors of the famous New Orleans cocktail. The grain bill for the 2018 version of Rye on Rye includes a touch of German rye and English crystal rye, which gives the brew a spicy backbone to build on. After fermentation, the Rye on Rye is poured into freshly emptied Templeton Rye barrels, where they age for six to 18 months. Boulevard then brews a fresh batch of Rye on Rye to blend back into the barrel-aged portion just before bottling. This step tempers the booziness imparted by the barrel-aging process enough so that the final product better showcases the flavors imparted by the rye whiskey barrels. The result is a complex brew that features notes of spicy rye with some charred oak and sweet vanilla. Boulevard is offering Rye on Rye in two formats: a 750ml. bottle and a four-pack of 12oz. bottles, which both sell for a suggested retail price from $10.99 to $11.99. The brewery, which was founded in 1989, was purchased by Belgian brewer Duvel Moortgat in 2013. That move has helped boost Boulevard’s distribution, which now boasts 39 states and several countries. Factoring in the beer’s barrel-aged process and alcohol content, we opted for a pairing with the strong, but elegant and complex Archetype Axis Mundi Toro. APPEARANCE: Pours a dark garnet, with a frothy white head with peaks about a finger-and-a-half tall. Gorgeous lacing with each swirl of the glass. AROMA: Oaky vanilla with some earth, grapefruit and a hint of lychee fruit. PALATE: The initial sip offers notes of sweet, charry vanilla before the rye’s spicy bite marches in with authority. Passion fruit and berries temper the rye at the midpoint, before a charry, malty finish. CIGAR PAIRING: Archetype Axis Mundi Toro (Nicaragua, 6 inches by 52 ring gauge, $12, 93 points, No. 13 Cigar of 2017) Rolled with a dark and toothy cover leaf, this cigar exhibits a rich vanilla, nut and caramel quality, balanced by hints of cedar and coffee bean. A delicious smoke. The cigar-and-beer combination creates a wonderful interplay of sweet and earth notes. 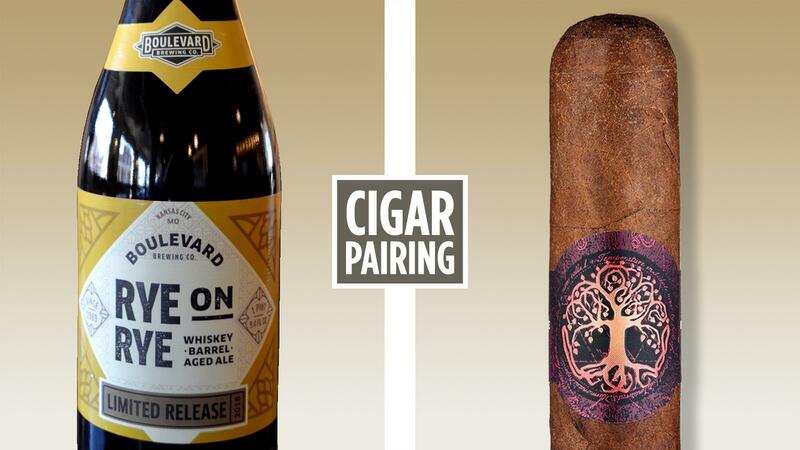 The vanilla in the cigar elevates the charred vanilla from the beer, while the cigar’s caramel notes tease out some underlying toffee from the beer. The smoke blows out the fruity notes, allowing more chewy oak and wood to show. A near-perfect pairing.